Vending Solutions and Vending Machine Management for all of your vending needs. 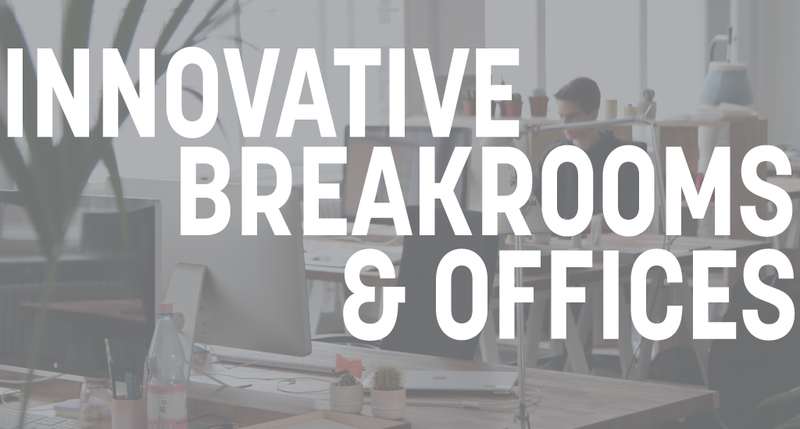 Is your business looking to upgrade their office space or breakroom? These changes could play a bigger role in your office productivity, creativity and employee retention. Before you take the plunge, update your office and breakroom with these tips. It’s easier to get your employees excited for change when they play an active role in tossing out ideas. Ask everyone to come up with three changes they would like to see in the new workspace. Discuss the changes that will be happening and give an explanation for what they can expect. When everyone is on the same page, the transition can be a lot smoother and more exciting. Consider adding collaboration stations where your employees can gather and encourage them to move around throughout the day to experience new people and spaces inside your office. Create social working hours where employees can hear ideas from others and be inspired by their coworkers and office space. This also allows for managers with offices to step out and enjoy the collaboration in a casual setting. Sitting can be detrimental to your employees’ health. Take the time with your office remodel to add in stand-up desks and collaboration areas. This can help decrease sedentary routines and shows you care about your employees’ health and well-being. Consider a micro market or offer a new variety of coffee to perk up employees. These changes can be exciting and encourage employees to stay on site for lunch. Looking for a way to keep track of your office supplies? We can customize a controlled dispensing solution that reduces supply costs up to 40 percent. Who doesn’t like to save money? We have a solution for office supplies, IT supplies and more. Add a place for your employees to have fun either during their break or after work. Games are a great way to encourage team building and can help spark creativity and problem solving. 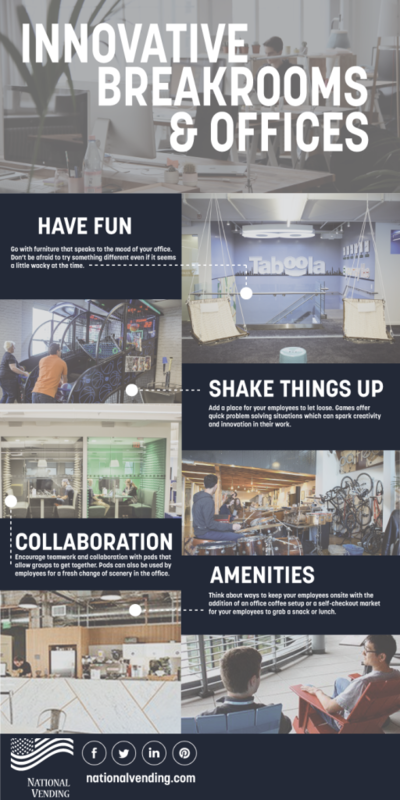 A common area with a pool table or ping-pong table can also encourage your employees to get to know their co-workers, which can build up your company culture. No matter what changes your company is able to make, keep your employees engaged and excited by showing updates and allowing them to be a part of the process. Updating an office or breakroom is exciting and gives the company the chance to show their culture in a fun and personal way. What changes would you like to see in your breakroom or office space? This entry was posted in Uncategorized and tagged Breakroom, Breakroom Update, Concept, Innovation, Office Innovation, Office Update, Snacks, Update, vending, vending industry, vending machine companies, vending machine management, vending management, vending network, vending products, vending services, vending solutions, vending technology, Women's Business Enterprise by National Vending. Bookmark the permalink.